Osteoporosis can lead to debilitating fractures, chronic pain and the inability to perform everyday activities, including walking, maintaining your household and even dressing and bathing. Fortunately, with the right diet, exercise, supplements or medication, you can either prevent osteoporosis or lessen the effects. “I have had three vertabrae fractures in the last two years. I’m still in considerable pain and cannot do the simplest of tasks. Vacuuming, window cleaning or anything to do with lifting, even a casserole dish, brings on severe pain. I went a whole year in severe pain, could not do much, struggled at work. . . . I could not open heavy doors, open filing cabinets, open car doors, etc., but tried to continue working. I’m part time, so on days off, I just collapsed and rested. It totally changes your life, and I don't think people really understand it. . . . I’m only 58 but feel like a very very old lady” (from the community forums of the National Osteoporosis Foundation). Women are more susceptible than men. Of the estimated 10 million Americans with osteoporosis, about 8 million are women. Approximately 1 in 2 women over age 50 will break a bone because of osteoporosis. A woman's risk of breaking a hip is equal to her combined risk of breast, uterine and ovarian cancer. For women, bone density loss speeds up during the first five to seven years after menopause, caused by a sharp decline in the body's production of estrogen, which scientists believe helps keep calcium in the bones. For seniors who are lactose-intolerant, many plant-based whole foods contain calcium. They include tofu, tapioca, collard greens figs, white beans, spinach, almonds and sesame seeds. Flexibility: Having flexible joints helps prevent injury. To flex joints and elongate muscles, stretch regularly or do t'ai chi or yoga. Although estrogen was once considered the standard osteoporosis treatment for postmenopausal women, new options are now available for men and women who are wary of estrogen's risks, such as breast cancer. Most osteoporosis medications slow down the rate at which the body reabsorbs bone, and one drug can help the body make new bone (from University of Maryland Medical Center). Your doctor can advise you about which of the following medications may be right for you. 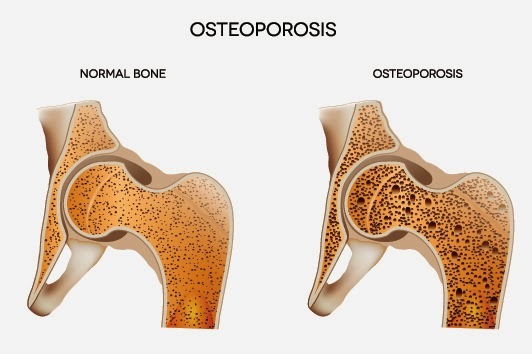 Sources“Learn about Osteoporosis,” National Osteoporosis Foundation“Osteoporosis,” University of Maryland Medical Center“Understanding Osteoporosis — the Basics,” WebMd. Bone Up on Facts about Osteoporosis was featured in the June 2014 Senior Spirit newsletter.